For me, this is one of my all time favourite discoveries in nutritional science. It is readily available, delicious, loaded in nutrients, has fantastic health benefits, will boost metabolism and help burn fat. REMEMBER, a healthy thyroid gland delivers a fast metabolism. This is one the most effective strategies to help with fat loss, improved energy and to build a great looking and healthy body. These are also the benefits of a Pro-thyroid diet that focuses on metabolism. For more information on Pro-Metabolic Nutrition Plans. WHAT IS THIS THYROID SUPERFOOD? ……….PULP FREE ORANGE JUICE……. 1. BOOSTS T3 HORMONE PRODUCTION. This provides optimal thyroid hormone conversion for a faster metabolic rate. 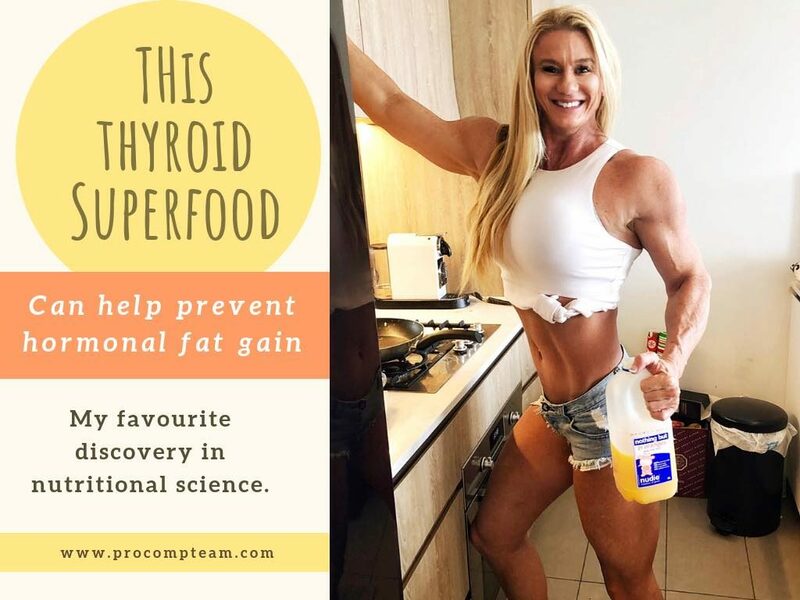 Sucrose and natural sugar is essential for keeping metabolism fast as it increases the conversion of T4 to T3 and ensures healthy thyroid gland functioning. Increasing metabolism is the primary mechanism that helps to accelerate fat burning. Orange Juice contains the anti-inflammatory flavonoids naringin and naringenin. They help decrease fat mass and reduce the fat gain associated with imbalanced hormones. This is particularly the case with estrogen. 3. HELPS REDUCE WEIGHT INDUCING STRESS HORMONES. Stress hormones are associated with weight gain. Lowering cortisol can be the most effective strategy for weight loss and improved health. – Stress hormones adrenaline and cortisol suppress thyroid functioning. – When thyroid hormone is suppressed, the ability to regulate blood sugar is compromised. – The liver requires T3 to store sugar in the form of glycogen. Sugar is constantly released into the blood stream to provide energy. When there is not enough T3, this can result in erratic blood sugar levels creating sugar highs and lows resulting in additional circulation and release of the stress hormone cortisol. – Stress hormones can also prevent the liver from converting the less active thyroid hormone T4 into the active thyroid hormone T3. – Elevated stress hormones cortisol and adrenaline and low levels of T3 hormone are associated with fat gain. So what does this all mean? The bottom line, the simple sugars in Orange Juice can help the liver store more sugar preventing blood sugar falling. This, in turn, reduces the amount of cortisol being produced resulting in a boost of T3 production. More T3 production then can lead to an increase in metabolic rate. It is the essential ingredient to help fat loss. Carbohydrates are the body’s primary energy source. The simple carbohydrates found in sugar also increases and sustains energy. OJ also has a lower GI rating than most complex carbs like potatoes, rice and oats. The fructose in the OJ does not require insulin to shuttle nutrients in to the cells and the potassium in OJ helps to dispose of the glucose without impacting blood sugar. This leads to a constant even energy. In Australia, I personally buy Nudie pulp free OJ. It is 100% pure juice from oranges with no additives or preservatives. I recommend the pulp free variety as the pulp is high in cellulose. Cellulose is difficult to digest in the gut and can cause bloating and digestion issues. The take home…….combining OJ with other pro-thyroid food in the right combinations can have an exponential effect boosting metabolic rate. Note: All the UNIQUE combinations of foods in the Pro-Metabolic nutrition plans have been based upon the research of leading endocrinologist, Dr Peat and associates – see research links below. Unique combinations of food in these Pro-Metabolic nutrition pans have been based upon the research of leading endocrinologists, Dr Peat and associates. They are designed to help increase thyroid gland functioning, reduce cortisol and balance estrogen. These are all essential hormonal factors for weight management, muscle gain and optimal health. Links are provided below. EBOOKS – Pro-Metabolic Nutrition System; Comp prep secrets. 4 WEEK CUSTOMISED PERSONALISED NUTRITION PLAN. ← A SIMPLE TEST TO HELP MEASURE METABOLIC RATE.